Stock photo of a chef performing with utensils and food while preparing meals at the Mongolie Grill World Famous Stirfry Restaurant in Whistler Village, British Columbia, Canada. 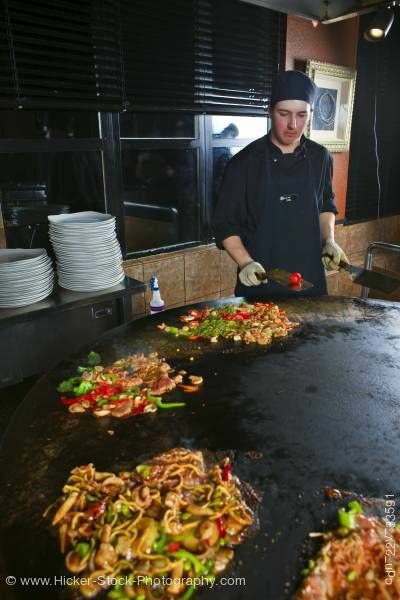 This stock photo includes a chef performing with utensils and food while preparing meals at the Mongolie Grill World Famous Stirfry Restaurant in Whistler Village, British Columbia, Canada. Property Released. Choose from a wonderful selection of succulent seafood, tender meats, garden fresh vegetables and Asian Pacific Noodles. All this together with any combination of our 18 different sauces. You create your perfect stirfry.